Consultation, photos, smile assessment, shading, pre-whitening polish, Tooth Mousse Teeth strengthening paste, Philips Zoom in-chair whitening and custom-fabricated trays for home application. Consultation, photos, smile assessment, shading, pre-whitening polish, Tooth Mousse Teeth strengthening paste, Philips Zoom in-chair whitening. Consultation, photos, smile assessment, shading, pre-whitening polish, 10 day tooth mousse, custom-fabricated whitening trays, whitening gels. Zoom ® is a new cutting edge technology for teeth whitening by Philips. It is quick, relatively convenient, has a long-lasting effect and it can protect the surface of your teeth and make them resistant to discolorations in future. Teeth whitening by Philips Zoom is a bleaching procedure that the dentists use to lighten the discoloration of the dentin and the enamel in your tooth. Is the Philips Zoom! ™ teeth whitening a bleaching process? Yes. It is a bleaching process and it is effective even on deep stains. The gel contains hydrogen peroxide. The bleaching process is accelerated by a side LED light. When the hydrogen peroxide is broken down in the process, the oxygen penetrates the dentin and the enamel and bleach the stains from inside the tooth. It is an amazing process. Many dentists claim that Zoom! ™ is the most effective teeth whitening treatment. It is one of the safest procedures for tooth whitening. How long does it take to complete a zoom™ whitening session? A full in-chair whitening with Philips Zoom™ normally takes four (4) sessions each is about 15 minutes. A total of 60 minutes for the whitening session. 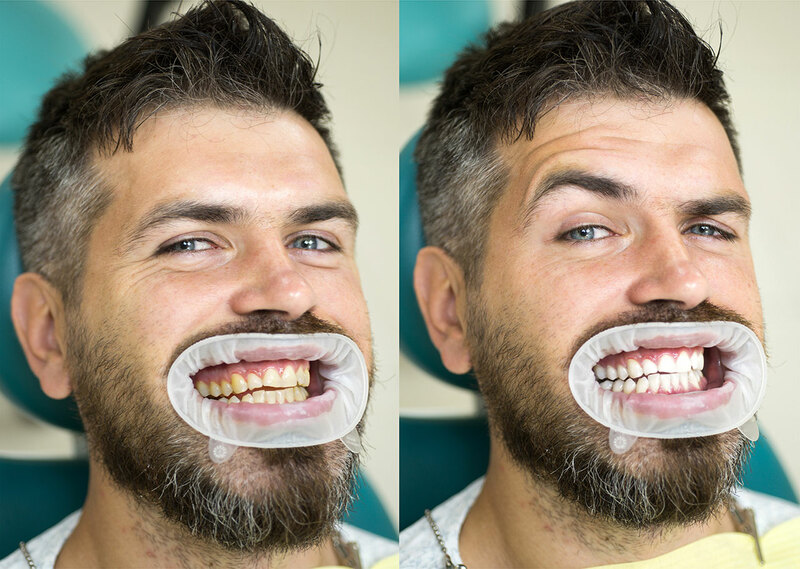 Is tooth whitening suitable for adults who have had orthodontic treatment? Yes. People who have had their teeth straightened via orthodontic treatments can have their teeth whitened. What is affecting the colour of my teeth? Medications like antibiotics, Tobacco, aging, lifestyle, energy drinks, tea coffee, cola, excess use of fluoride and genetics can cause stains on your teeth. Can your Dentist remove coffee stains and red wine stains from my teeth? Yes, if your teeth are affected by consumption of tea, soda, coffee, red wine and tobacco, then these stains can be removed from your teeth in a one hour appointment. Upper mt Gravatt cosmetic dentist Dr. Ellie from Pure Dentistry has been using Zoom® for many residents in mt Gravatt, Wishart and eight mile plains successfully. With this tooth whitening technology, the dentist can lighten and whiten your teeth up to eight (8) shades in just one appointment and provide you with a white bright smile like a movie star. Most patients find their teeth to become six (6) to ten (10) shades whiter. 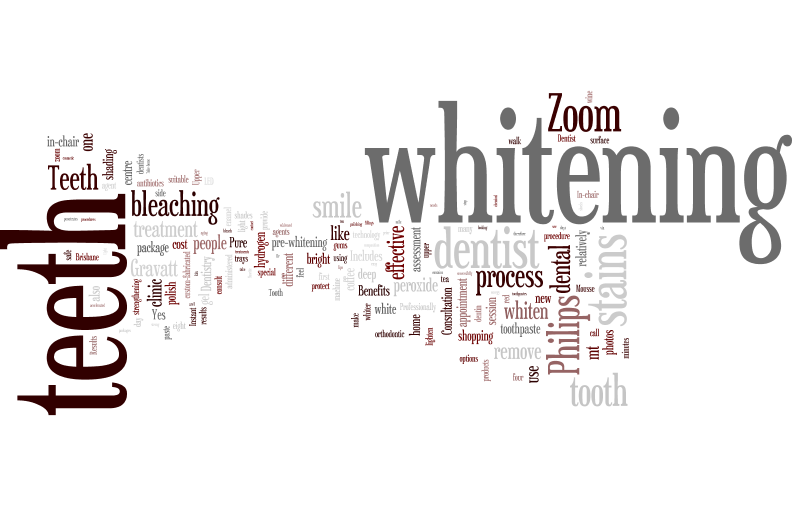 How does the dentist use zoom® teeth whitening? The procedure is performed by our dentist in her dental chair. The dentist isolates your gums and lips by covering them first to protect them. Then your teeth are coated with a special light-activated whitening gel provided by Philips Zoom. The dentist then uses the whitening machine to apply LED light to your teeth. The dentist repeats the process three (3) to four (4) times and replaces the gel coating. Dark stains on teeth caused by antibiotics are relatively more difficult to whiten and the level of whiteness depends on the teeth composition therefore the results are different from one patient to another. What are the side effects of Philips Zoom tooth whitening? Some people experience short-term sensitivity. Sometimes it is strong for some people but for many people including the writer it goes away in a day. It is worth it. Some people feel like small electric shocks in and around their gums and teeth. If you are3 worried about these, checks with our dentist if you can use Ibuprofen prior to your teeth whitening session. A whitening toothpaste includes chemical agents and or polishing agents that can remove certain stains from the surface of your teeth. it is not a bleaching agent and cannot remove deep stains. With a whitening toothpaste, you can only remove superficial stains. To remove deep stains bleaching products are required. The results also tend to fade when you stop using the whitening toothpastes. Should I consult with my Dentist about teeth whitening? If you have extremely dark stains, or if you have lots of fillings and dental crowns, you should consult with your dentist about teeth whitening first to see if whitening is a suitable course of treatment for you. 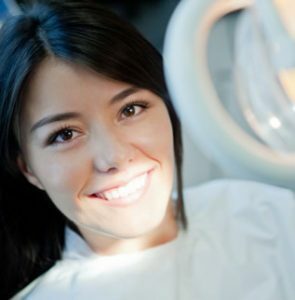 Your dentist can also supervise the whitening process and include it in a correctly-sequenced treatment plan. Is it safe to whiten my teeth by swishing hydrogen peroxide? No. It is not safe to whiten your teeth this way. Hydrogen peroxide is a tooth bleaching agent but it requires a proper delivery system. If you are looking for a low-cost tooth whitening product contact Pure Dentistry. We provide a range of whitening products. Light activated whitening is relatively high cost because it needs a special whitening machine. But we also supply take-home kits that are very cost effective and whiten your teeth in 10 to 14 days. At our dental clinic in the upper mt Gravatt shopping centre, we have different teeth whitening options on the menu. Please feel free to call us about the costs and options. If you are interested in whitening your teeth in Pure Dentistry and would like your teeth to appear whiter today call us to make an appointment and get ready to ZOOM! Our dental clinic is next to COLES in the village shopping centre and easy parking is always available. The Village shopping centre is at 1932 Logan road, upper mt Gravatt and is different from Westfield Garden City. Give your smile a lift with our teeth whitening treatment. Contact us or visit our cosmetic dentistry office in upper mount Gravatt shopping village today for a consultation.